With a deep gold, slightly orange hue, the hop-forward Windows Up IPA shows that the West Coast IPA is still thriving and evolving. The new offering from Alpine uses in-demand Citra and Mosaic hops and is described by Alpine as falling squarely under the “dank” category. The mix of Citra and Mosaic hops is both soft and bitter, the best of both worlds. With an aromatic floral and orange nose, the flavor profile is equal parts soft and supple Citra goodness with Mosaic potency. The flavor begins soft on the mouth with a green meets papaya-citrus wash over the tongue that breaks away in a piney punch that leads to a bitter finish. The 41-IBU count won’t set any tongues awry either, as it doesn’t linger quite as long as one expects with such a resinous first impression. The dank base is complementary to the bitterness instead of balancing with a counterpunch. 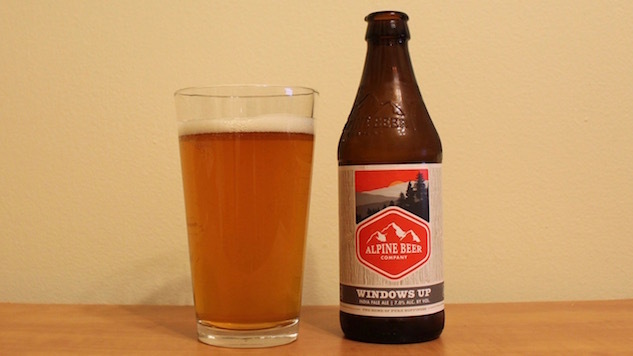 Windows Up is an IPA of two profiles that truly meets in the middle. There’s some transition when the different lead hop kicks in, but the malt build has an undercutting sweetness that marries the two and leads to that finish that’s both wet and comforting, but also zesty with some pick-me-up. Windows Up is an IPA that hits familiar elements of the style and highlights why it’s still so popular today: because it’s so versatile, yet unpredictable. There are 4,000-some USA breweries today, which means there are probably 10,000 IPAs. Many of those also feature the same ingredients, but rarely do you find one with the same balance as Windows Up.